In January, 2002 we began testing our Verified by Visa merchant plugin technology. Online purchasing customers use a PIN code with their Visa credit cards, similar to those used with ATM bank cards. When the customer makes an online purchase, they use their credit card and PIN code over a secure connection with their issuing bank. The bank then signs the transaction and passes this signature to the merchant to positively identify the customer. This technology is designed to reduce merchant chargeback fraud significantly. Our Verified by Visa plugin is available to Visa members to purchase as required. We provide the plugin on a per license basis with the necessary implementation and ongoing customer support. Using a personal password that you create, Verified by Visa helps ensure that only you can use your Visa card to buy online. Once Verified by Visa is activated, your card will be recognized when you purchase at participating online stores. You'll be asked for your password, your identity will be verified, and the transaction completed. In stores that are not yet participating in Verified by Visa, your Visa card will continue to work as usual. 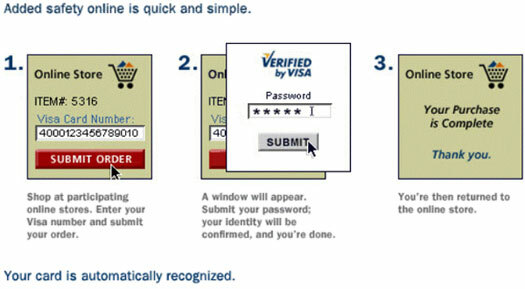 Look for the Verified by Visa symbol, displayed at many participating online stores.